Derestrict your Electric Bicycle ! Figure out which kind of motor powers your electric bike (motor designation). Find out which tuning tools are compatible which your motor type. To do that, simply use our “Guideline” and the “Comparison”! Order your desired tuning tool and install it: “Shop”. Great E Bike Tuning brands - Let´s make your pedelec faster! RedPed: The latest tuning dimension for Bosch & Yamaha motors! RedPed (199 Euro): The new PedPed is probably the most comprehensive tuning module for Bosch Active, Performance, CX & Active Line Plus, as well as Yamaha PW-XE / PW-SE or Yamaha Syncdrive (EVO / CHARGE display) or Syncdrive Life on the market. It offers correct speed values in the display and lots of other useful parameters via the smartphone app. Core features: Setting the max speed individually from 15 up to 75 km/h, exact adjustment of the wheel diameter to the millimetre, individual activation / deactivation via the control buttons of the E Bike, setting the visibility of the Bluetooth traffic, using a practical logbook via the app and many other functions. The most powerful product for Bosch & Yamaha E Bike systems! MountainTuning Tool (MTT): Maybe the best E Bike tuning product available! MountainTuning Tool (299 Euro): Probably the best E Bike Tuning product on the market. Use the MTT to set the maximum speed of Rocky Mountain Powerplay motors via software tuning from 0 to 99 km/h. Even the current strength can be increased from 20 ampere to 22 ampere, which means 10% more power! You can also enter the exact circumference of the wheel. Of course, you can restore the initial configuration whenever you want. Special feature: The dispaly of the MountainTuning Tool can be used as an alternative E Bike display to the existing iWoc - this means the MTT can display the current speed when you are riding! The best E Bike tuning product you can get! BluePed: Probably the most extensive Yamaha Tuning – Correct values on the display! BluePed (149 Euro): Yamaha Powerdrive motors have the advantage to enjoy the (probably) most extensive electric bike tuning. Use the Smartphone app to configure the Blueped module individually. The electric bike display will still show the correct values (speed etc.). There is a really great amount of setting options. The Blueped Tuning Module is a good selling point for electric bikes with Yamaha PW engine. Innovative electric bike tuning for Yamaha Powerdrive motors! JUM-Ped: Elegant software tuning for Neodrives and Xion motors! Jum-Ped (189 Euro): The new JUM-Ped for Neodrive and Xion engines is a comfortable software tuning product. The max speed can be set from 15 to 37 km/h. The pushing aid can be adjusted from 1-11 km/h (some manufacturers software versions may only allow a maximum of 6 Km/h). The support levels are individually adjustable from 1 to 5 (50 - 300%). Many other features are also included. Of course you can restore the original configuration of your engine at any time! Ingenious E Bike tuning for Neodrives and Xion E Bike motors! GreenPed: Perfect Yamaha Syncdrive Tuning – Correct data on the display! Greenped (149 Euro): An optimal tuning module for Yamaha Syncdrive motors. Use the Greenped app to get access to your electric bike via Bluetooth – this allows you to use a very wide range of setting options (more than most other tuning tools). For example, you can set the height of the maximum motor support to an individual value ranging from 15 to 75 km/h. You can also determine the wheel circumference individually. Another advantage: While you are riding, the Smartphone app can show you many useful parameters that go far beyond what the normal Yamaha display can offer you. Very good electric bike tuning for Yamaha Syncdrive engines! Blackped+: E Bike Tuning via smartphone – Extensive setting options via app! BlackPed (99 to 149 Euro): The new generation of electric bike tuning tools: The convenient electric bike optimization via app and especially the connection between Smartphone and electric bike. After the installation of the BlackPed module, you can make wireless settings – for example, you can set the speed at which the tuning shall be activated or adjust the wheel size... The new BlackPed+ turns your electric bike with Bosch or Yamaha engine via Smartphone into a real smart e bike with many setting options and parameters – for example, the display of the burned calories. Every BlackPed or BlackPed+ can be ordered optionally with FINN Smartphone holder and / or with charging cable. Sx2 Dongle - Double the speed limit of your electric bicycle! Sx2 Dongle (139 to 159 Euro): The Sx2 Dongle doubles the speed limit of your electric bicycle. E Bike Tuning for Bosch Active, Performance, CX and Classic, Panasonic, Brose, Impulse and Yamaha motors. Simply faster up to 50 km/h motorassisted. All motor assistance levels of your e bike are retained. The Sx2 Dongle causes no changes in the engine electronics. Important feature: You can remove the Dongle within 2 seconds if you want to drive legally on public roads again. 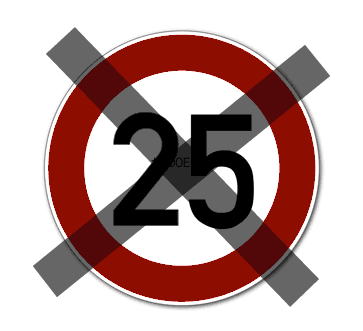 ASA eSpeed - Derestrict the 25 Km/h speed limit! ASA eSpeed (138 Euro): Derestriction of the 25 km/h speed limit for Bosch Active, Performance and Classic Line motors. Microprocessor-based microelectronics with programmable functions. Installation without damage to the cable and thus the possibility of a simple return to the original status. Full functionality of the HMI, in particular the tachometer and the auxiliary functions (km, max speed, average speed, etc.). Self-calibration for different wheel sizes. Status LEDs for functional control during installation. Badassebikes Box - The reliable and simple tuning box – Attach and drive off! Badassebikes Chiptuning Box 3.4 (139 Euro): The new 3.4 version of the BadassBox is very popular among the customers of our shop. Thanks to the upgrade from version 3.3 to version 3.4, from now on the BadassBox is compatible not only with Bosch, but also with Yamaha, Impulse, Conti, Brose and Shimano STEPS electric bike motors. Now we can finally add Conti and Shimano Steps to our positive list “Electric Bike Motors which can be tuned”. Recently there is even a special “Freeze” version for Shimano STEPS with Di2 (displayed kilometres will be “frozen” at a certain speed). From a speed of 16-22 km/h the BadassBox starts to half the values transmitted by the sensor – as a result, the amount of the maximum engine support is doubled. The box has a stable housing and is powered by a strong battery (6.000 km). Advantage: Extremely easy attachment and removal. The JUM-Ped - Software tuning for Bosch Gen1! JUM-Ped (209 Euro): Simple tunining for Bosch Classic Line E Bikes. The new JUM-Ped takes away the 25 km/h (Pedelecs) speed cut off restriction so that you can reach much higher speeds with full motor assistance. Even though your E Bike is tuned, your Display will still show the correct pace etc. You can install the JUM-Ped without special tools or knowledge within in a few moments. The wheel circumference can be read and re-entered between 500mm and 4000mm. You can enable or disable the bike light function, too. In the display, you can switch between miles or kilometers. Of course, you can undo the tuning whenever you want to. PearTune MSO - Take away the speed limitation! PearTune MSO (139 to 179 Euro): The PearTuns MSO (“max speed off”) is a new tuning product for electric bicycles with Bosch, Yamaha (PW, Syncdrive and PW-X), Shimano or Brose drive systems. It will take away the speed limitation and de-restrict your electric bike motor. If you use this tuning tool, all relevant data like current speed, distance, average- and max-speed will be shown correctly on your display (except Shimano STEPS E8000) – even if the tuning is activated (however, there can be some deviations with some variants). The PearTune MSO tuning tool can be easily controlled via the operating buttons (light or walk) of your electric bike display. Speedbox - Derestrict your E Bike! SpeedBox (99 to 299 Euro): The new Speedbox 2 is another astonishing tuning product we have added to our shop. It can be used to optimize electric bikes with Bosch Classic, Active, Performance, CX Line motors as well as Yamaha PW Powerdrive Units, PW-X, PW-SE and Syncdrive C motors. The big advantage of the Speedbox 2 is that all parameters on the display will be shown correctly. For Bosch motors, activation is possible via the walk button and for Yamaha engines via the light button. The Speedbox 1 tuning tool is even available for Shimano, Impulse, Brose and Bafang Max Drive motors - but in this case, only half of the real speed is displayed. New: SpeedBox 2 for PW-X and Syncdrive Sport motors. SpeedChip: Correct values on the display and configurable via PC! SpeedChip (139 Euro to 159 Euro): This tuning module takes away the 25 km/h speed limitation. Nevertheless, all values on the display will still be shown correctly (current speed etc.). If you connect the SpeedChip module to a PC via USB cable, many settings can be made on the computer. For example, you can set the level of the maximum engine support individually from 15 km/h to 75 km/h or you can adjust how to activate / deactivate the tuning module. You can also set which kind of engine you use (Bosch Classic, Active, Performance or CX). Completely new is the variant for Yamaha PW motors. Conclusion: A real enrichment on the E Bike Tuning market! We have thoroughly tested all tuning products (outside the scope of road traffic regulations) and we consider them to be highly recommendable. The installation of the tuning tools is quite simple, depending on the respective tuning tool and your electric bike type. If you have any questions, please do not hesitate to contact us via our support form (before or after the purchase). Tip: Open a customer account and order our newsletter - this makes sense especially if there is no suitable tuning product available for your bike yet. Our newsletter will inform you which electric bikes can be tuned and it will make sure that you won´t miss any developments on the electric bike market anymore. 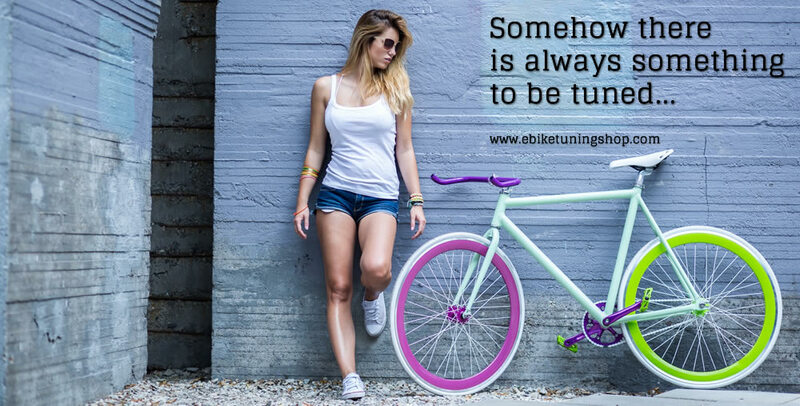 Please bookmark this page and start to explore our E Bike Tuning Shop! Legal information: We explicitly point out that electric bike tuning products may only be used on pedelecs / electric bikes in private, enclosed areas – for example, for sports and advertising purposes. Electric bike tuning manipulates the speed of your pedelec / electric bike, and this is not allowed in the area of road traffic regulations. You have to use the tuning products from our shop at your own risk. No liability shall be assumed for any (present or future) damage to objects and/or persons caused by an improper installation / de-installation of a tuning tool from our shop. The warranty of your electric bike / pedelec will be limited or expire by the use of the tuning, as the installation or use of the e-bike tuning results in a modification / manipulation of your electric bike / pedelec. Even the installation of a larger chain ring can result in the expiry of the manufacturer´s guarantee. If your e-bike has an operating licence, it will generally expire as well. Please always drive carefully, use protective clothing such as helmets or protectors and do not put yourself or others in danger. Talk to your insurance company beforehand to make sure all of your actions are protected in the best possible way. Please keep in mind that other legal regulations apply in other countries. This is especially important when you go on holiday with your electric bike. Please inform yourself beforehand and comply with the applicable laws.